If you are not familiar with this story please take five minutes and read. This should scare the hell out of any parent, especially as this is NOT an isolated incident. This can happen to ANYONE. In summary Justina is a teen who was diagnosed by doctors at Tufts with a rare Mito syndrome. This is especially difficult to diagnose but her sister has a similar diagnosis so it appears to be hereditary. Tufts is a highly respected institution and the doctors that diagnosed her were experts in the field. After diagnosis, Justina was taken by her parents to another hospital, Boston Children's, for a completely unrelated issue - complications from a cold or virus. While under their treatment, the team at Boston Children's disagreed with the other diagnosis saying that the symptoms were psychological, not physical and accused the parents of "medical abuse". Keep in mind that none of the doctors at Boston's who examined Justina are experts in Mito disorders and a proper psychiatric exam was never fully conducted. 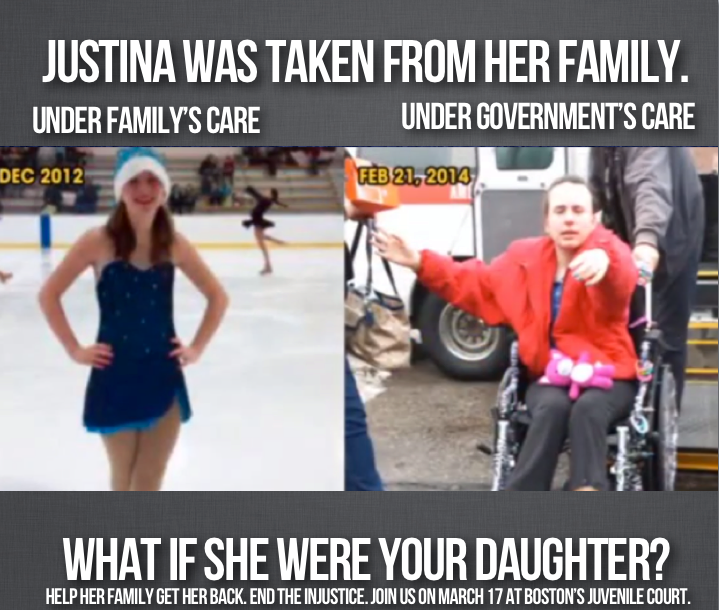 Long story short, Boston Children's called in MA DCF and gained custody over the girl so they could keep Justina under their care. Their "care" reportedly involved stopping all medical treatment for the Mito issue so during this time (several months) the girl, Justina, has not been getting the treatment that she needs. The parents have had limited visitation and Justina has literally been wasting away over the last few months. If she does not receive the proper care it is very likely that she can die. The before and after pictures of how she looked right before admittance to Boston Children's and how she looks now are alarming. In a final custody battle, the state of Massachusetts "permanently" stripped the parents of custody, not based on the medical facts, but based on the fact that the father had been extremely vocal during this process. The judge claimed that he was "verbally abusive") to DCF staff, drawing attention to the incompetence of DCF and Boston Children's. This has NOTHING to do with the medical reasons of the case or their ability to parent their children. This has received wide media attention. The thought that this can happen today in a democratic society is terrorizing. Even worse is that there are children who are truly being abused. The time that DCF has spent on this case could have been spent where it is really needed. Think of all the cases where children were hospitalized or died and it comes out that social services was involved but missed a visit or did not probe deep enough into a case because of huge caseloads and a shortage of staff. Here are parents who are obviously loving and caring yet being denied access to their child. Other Americans are completely disgusted and distressed that this can happen in this day and time. Some people are even threatening DCF and Boston Children's. I do not agree with threats of physical harm but it is imperative that people bring attention to this matter until the situation is resolved. That includes signing petitions, writing letters, placing calls, etc. Many people are calling for individuals to boycott the state, including the upcoming Boston Marathon, which brings in a huge amount of money. American Dream Builders - Information and Giveaway! - Enter to win your dream home - You will have the opportunity to earn 5 bonus entries when you “Dream It Yourself”! - Upload a photo and description of a home project you are working on and EARN 5 BONUS SWEEPSTAKES ENTRIES. - Finally, follow the show on Facebook and Twitter for a chance to win more prizes from American Dream Builders and Lowe’s! Interested? #DreamBuilders Get Social With It! • You can LIVE TWEET with the judges - Nate Berkus, Eddie George and Monica Pedersen! #DreamBuilders - Join the judges and contestants on Twitter as they LIVE TWEET along with the show. - Get rid of the ugly popcorn ceiling! What would you do? Thanks to Lowes and American Dream Builders look what I have to share with one very lucky reader! Simply comment here on one change you want to make and then fill out the rafflecopter form. Extra entries available. I DO verify so make sure you follow the requirements. Have fun dreaming of your design wishes and good luck to all! Disclosure: I did not receive any form of compensation for this post. This giveaway information and gift card will be provided directly to one qualified random winner from American Dream Builders. If you missed opening weekend for Divergent and have not read the books you may be wondering what all the fuss is about. I was lucky enough to see and early preview last week. Because I knew the movie was coming out, I made sure to read the book. Why? I watch the movie first without reading the book it is unlikely that I will ever read it because what is the point if you know how the story ends? I took my oldest daughter to the movie with me and she did NOT read the book (she does not like to read period). We both loved the movie. Reading the book helped somewhat with understanding the plot but it is definitely not a pre-requisite to seeing the movie. I answered maybe one or two questions for my daughter early on but after that she got the gist of the story and enjoyed the film. - Later at the celebration they select the faction they belong to regardless of the test results. The testing is simply given to guide them. Many, despite their predisposition to another faction, will chose their home faction. To chose a faction outside of the one you were raised in means turning your back on your family (thus the mantra faction before family). Selecting a faction does not guarantee acceptance however. The faction must also accept the individual - those that are not accepted by their faction cannot join another and essentially become factionless - this is very similar to being homeless. Tris, the lead character shows us early on that she is not cut out for the faction that she was born and raised in (Abenation). She is not naturally selfless and struggles with having the innate instinct to help others - for her it is always an afterthought. Tris is really counting on the test results to help her determine what faction she is best suited for but when she takes the test, the results are inconclusive. In panicked secrecy the test administrator tells Tris that she is something called Divergent and that it is very dangerous - if the government finds out that she is Divergent her life will be in danger. Tris has never heard of Divergence before and is not sure what it means and why it is dangerous. The test administrator purposely "loses" the results of the "inconclusive" test. Not being a natural fit for a faction makes Tris anxious about the ceremony. She is still not certain what she will do but she is confident that her twin brother will stay with Abenation as he is naturally selfless and has always seemed "in place" at home. Her mother encourages Tris and her brother to follow their hearts but she struggles with this as she does not want to turn her back on her family. Tris soon finds that she does not know her brother's heart - or her own - as much as she thought. From this point on we see Tris fight and struggle to find her place and fit into society. While she acclimates to her home, she tries to hide any indications of being divergent, she discovers that being divergent is only one danger. There are many who wish to change the structure of the factions but these plans are built on corruption, repression and inequality. With the help of four, her group leader and mentor, she starts to learn more about herself. I felt like the movie stayed mostly true to the book - there were a few notable differences but overall I was pleased with the results. Many people were mixed on their feelings of Shailene Woodley being cast in the lead role. I do have to say though that after reading the book I can see why she won the part - The character Tris is a complex one - on the surface she seems reserved, quiet and plain. Her personality seems flat and she keeps her emotions to herself. Underneath though there is a fire inside Tris. As she grows as a person and gains confidence in her abilities and her place in society, she begins to find her voice and her purpose. Shailene seemed to understand this and was able to bring the character to life. The most important thing that Tris learns about herself is that being diveregent means not being able to be stereotyped or put into a category - as a divergent she is multi-faceted and less likely to conform. This ends up being critical to her place in fighting repression of the government. I found that I actually enjoyed the movie better than the book - this happens almost never. I find that the book is consistently better than the movie, This was a pleasant surprise because although I enjoyed the book, I found myself constantly comparing it to the Hunger Games which is unfair. Both series have similar themes but they are separate and should each be weighed on their own merit. There really is too much to put in a review - there are so many other pieces to the story that are best revealed by viewing the film. If you are looking for a good movie I do recommend this one. Some movies I wait for the DVD but others I categorize as worth a theater visit - this is one that is worth a trip to the theater. Please keep in mind that this is not appropriate for younger children as it is geared towards young adults. There is quite a bit of violence and other content that is more appropriate for mature audiences. Disclosure: Movie passes were provided to me for review purposes. I did not receive any form of compensation nor was I required to write a positive review. All opinions expressed are my own. Are you a Veronica Mars fan? Well if so, the story continues..... Following a record-breaking Kickstarter campaign that ended on April 12, 2013, Veronica Mars was shot over 23 days during June-July 2013. It will be released in selected theaters nationwide on March 14th, 2014. • Think you know all there is to know about Neptune, California? Test your Veronica Mars knowledge with all 3 levels of super-fan trivia and find out if you are the ultimate Marshmallow! Thanks to Warner Brothers I have a great prize to giveaway to one lucky winner. To enter simply take the 3 levels of “Purity Test Marshmallow Super-Fan Trivia” and post your results in the comments section below as your main giveaway entry. Extra entries available. One entrant will win a Veronica Mars DVD. Please note that each household is only eligible to win One (1) Veronica Mars DVD via blog reviews and giveaways so if you win off of another blog you would not be eligible to win one here as well. Only one entrant per mailing address per giveaway. Have fun with the quiz and best of luck on the giveaway! Disclosure: Warner Bros. supplied the information and giveaway materials. I did not receive any compensation for this post nor was I required to write a positive review. Any and all opinions expressed are my own. . When I was growing up if I wanted to research something I headed to the library, looked in the card catalog and/or encyclopedia until I gathered all of the information that I needed. Now days if I need information I simply look on my computer. Because information is so readily available, I consider myself better educated in many areas, especially anything health and diet related. Easy access to information means that I am paying closer attention to how the choices I make have a bigger impact on me and/or my family. This knowledge has changed my grocery shopping habits and the way that we prepare food for our family. I now frequently buy veggies and lean meats. We bake or grill and use less fat but more flavoring. Even my kids are starting to appreciate eating right - tonight my 11 year old asked me to make brussels sprouts for dinner tomorrow! (This was totally a proud mom moment for me!). Although our diets are much more veggie-centric, because we both work it is sometimes more realistic to use a combination of fresh and canned ingredients versus cooking everything from scratch. Interested? Before you run off and start cooking, make sure that you check Campbell's website and check out what savings are available to you! http://www.campbellskitchen.com/SavingsCenterLandingPage/CouponsAndSpecialOffers.aspx . Disclosure: This post is sponsored by the Campbell's Soup company. Information and recipes were provided by Campbell's. I did receive a gift card from Campbell's as a thank you for sharing this information with my readers. Any opinions expressed are my own.